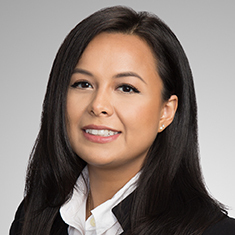 Dorlin Lafer-Sousa focuses her practice on mergers and acquisitions litigation, general complex commercial litigation and civil appeals. She joined Katten Muchin Rosenman LLP after serving as a briefing attorney for the Honorable Justice Mike Willson, Eleventh District Court of Appeals of Texas. Dorlin has distinguished herself through her courtroom experience. During her first year of private practice, she served as trial counsel in two separate jury trials involving complex commercial disputes, which included presenting a trial witness and arguing a directed verdict. During this time, she also successfully argued several motions for summary judgment in Dallas County, conducted over a dozen depositions and served as lead counsel in a civil appeal filed with the Dallas Court of Appeals. While in law school, Dorlin was an active moot court competitor, winning several regional and national competitions. Due to Dorlin's success as an advocate, she was inducted into the prestigious National Order of the Barristers. Dorlin is also the recipient of the Sarah T. Hughes Diversity Scholarship and served as executive editor of the SMU Science and Technology Law Review. Shown below is a selection of Dorlin’s engagements.